In the far corner of the northeast Thailand, 679km from Bangkok, lies Ubon Ratchathani. This was until 1972, the largest province in Thailand; Yasothon was split off in 1972 and Amnart Charoen in 1993. According to history, Ubon – once the administrative center of “monthon Isaan” – was founded in 1786 by Thao Khampong, a Laotian prince who fled his country. “Isaan” – as the northeast of Thailand is commonly called — comprises of 19 provinces, with a language and culture of its own. 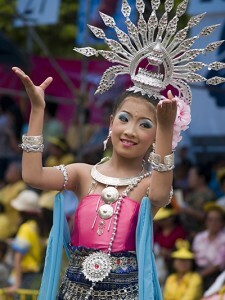 Music is an integral part of life in Isaan, and it is said that some of the best Thai dancers come from this region. Isaan music is sweet and melodious, typified by the sound of the khaen, a flute-like instrument made from bamboo, which is representative of the mood of the area. Ubon has an interesting past. Found in the border town of Khongchiam on the banks of Mekong River is the Pha Taen National Park. It is notable for its forest cover and for exclusive rock art paintings estimated to be 3,000 years old. The park also has a collection of mushroom rocks. Pha Taem National Park overlooks the Mekong River and Laos. The view from the sandstone cliff is awesome. The 300-painting caves are almost 180 meters and are considered to be the finest prehistoric paintings in Thailand. The province, located on the Korat Plateau, is mostly forests and rice fields, but there are many national parks and botanical gardens. Two rivers, “Mool” and “Chu” run through the province while the mighty Mekong River demarcates the border with Laos. A modern international airport was built in Ubon in 1990. International in name, it operates only domestic flights. The only international element in Ubon nowadays is the farangs who have married ladies from this province and have made Ubon their adopted home. There are a few hundreds of them. Midtown Ubon is deserted after dark. Shops close early save for a few restaurants that operate on the banks of the river Moon. Ubon and I share a special bond. My family lived there for over 20 years (during the 60s). A sister and brother of mine were born there. My father, like most Indian immigrants, was in the textile retail trade. I remember that there were about 15 Indian shops then, lesser now as many relocated to Pattaya and Bangkok after the withdrawal of the U.S. forces. 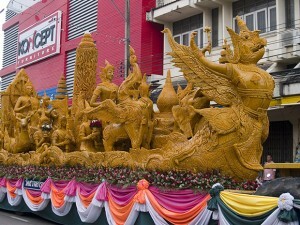 Ubon also has a large number of Chinese immigrants who mostly indulged in trading activities. Some operated restaurants, coffee shops, and hotels. With the Chinese, the assimilation and integration into the Thais was a matter of course. The Thai-born children of these Chinese immigrants adopted the Thai culture and way of life. Most changed their family names. The new generation was readily accepted. During the Indochina war, a large number of Vietnamese immigrants crossed the mighty Mekong River to seek refuge and settle down in the provinces of Northeast Thailand. Having settled down they did all kinds of work to earn a living. Most of them grew vegetables and fruits, and sold the produce in the market. Over the years they made a conscious effort to mingle and integrate with the Thai society. Their children married local inhabitants and became a part of the Thai society and the Thai stream of life. The end of the war marked the revival of mass migration back to their motherland. The elderly and the older generation, homesick, decided to return home while the young ones born in Thailand opted to stay in their adopted country. Many of them now operate shops selling fermented pork sausages and other goodies. Some operate Vietnamese restaurants. A great many of them have joined the government service. Division of the Royal Thai Air Force — but the runway was extended to accommodate the B52 bombers. American troops who lived on the base frequently came into town when off duty. The advent of the Americans saw the birth of new businesses: Ubon restaurants thrived, the real estate sector grew, and the once-sleepy town became lively. New jobs and establishments were created to cater to the American soldiers. The Australian Air Force, part of the alliance, followed them. When the Americans and Australian forces departed, they left a legacy remembered until today. In trying to renew old recollections, it’s hard to unfold the past as it were. So in coming to a place where we have formerly lived, and until which we have intimate associations, the feeling grows more vivid the nearer as we approach the spot, far from the mere anticipation of the actual impression. We remember circumstances, feelings, persons, and places, names that we had not thought of for years. Long forgotten things, burst upon my eyes sight, and I begin to feel, think, recall once upon a time. I remember befriending Capt. Roger Kobylac, a soldier in his early 20s, who was frequently seen in town when off duty. He and I became friends and we spent many moments of joy together. He went home to the States after serving his term and while we communicated for a while, soon lost contact with each other. I tried to locate him when I visited the States in 1980 but to no avail. There were so many others like Roger: friendly, kind, and helpful. They brought not only joy but also a very special feeling of brotherhood to the residents of Ubon. The presence of farangs was largely instrumental in generating a desire among the locals to learn the English language. A tailor called Harn who, for lack of formal education, saw the importance of learning English after work in the evenings; he was so determined, he seldom missed a tutorial. I lost contact with him soon after relocating to Bangkok. Each time I go back to Ubon, I visit his shop. The United States Information Service once had a library in Ubon, with perhaps the single largest collection of books in English. It closed down a few years ago. Now, the only source of information in the area is the Ubon University library. Ubon is also a seat of learning in the Northeast with a university and several institutes of learning. Students from nearby provinces come for higher education. My friend, the late Ying Sithitham, owned the Sithitham School, which is now known as the Ubon Polytechnic College. Ubon is still the sleepy town that it was. Little has changed. There is very little business activity. All the action if any, seems to have moved to the outskirts. There are a few shopping malls, cinemas, bars and massage parlors that cater to the young students local residents and visitors from provinces nearby. The hustle and bustle that once existed exists no more. The town has a regular bus service; and small “song thaew” buses operate on few popular routes. There are plenty of “tuk-tuks” and tricycles, though, and car rental service is available at the airport and at almost all the hotels. The airport pickup service is provided free of charge by the hotels. In the center of town, Ubon once boasted of accommodating a racetrack where Thai ponies used to race periodically. Racing, like other activities, died a natural death around 1960. The railway station looks the same and so does the town of Varin situated across the Mool River on the opposite banks. The train journey then took 12 hours from Bangkok to Ubon stopping at several stations en route; it takes almost the same number of hours now. Doing the rounds of the streets of Ubon, I noticed only the elderly folk. The young ones have left for Bangkok in search of jobs and better opportunities. There are few jobs available locally because Ubon lacks major industries. The village and townfolk go the Bangkok; many have ventured abroad. People in the Northeast are by and large honest, hardworking, and good at whatever they do. The cooks, construction, factory workers, majority of taxi drivers, and many other employees in Bangkok all come from this area. The streets of downtown Ubon are fairly deserted except during the “Ubon Ratchathani Candle Festival,” which is held around July to mark the beginning of the Buddhist Lent, and draws a good number of visitors from both overseas and the provinces nearby. 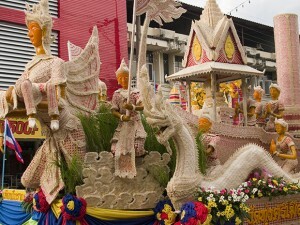 The “Candle Festival” is the largest religious ceremony in Ubon. It is THE event of the year for the province’s inhabitants. Every year beginning in July, Buddhist monks refrain from any form of travel, staying in one particular temple for three months, in what is called “phansa” (Buddhist Lent) in Thai. 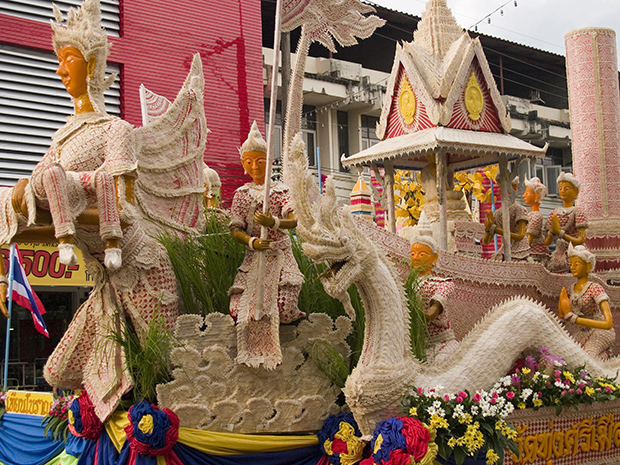 It starts with “Khao Phansa (Rains Retreat) and ends with “Ok Phansa,” and ancient tradition that dates to the time of the Buddha. I miss the Ubon of the 60’s. I miss all those acquaintances and friends, most of whom have since departed. I miss the hustle and bustle created by the presence of U.S. Armed Forces. I miss the friendly neighbors, the Chinese coffeeshop next door, the street-hawkers, and the old milkman who never failed to arrive each morning. I miss the school where I used to teach English during my summer vacation. The deserted streets bring back memories of days when I used to roam around. It’s time for me to return to Bangkok’s madding crowds. At the end of a sentimental journey, I bask without regrets. Wonder has gone, but admiration remains. The town has lost its mystery but found its meaning, and takes its place in a scheme of things far beyond the scope and comprehension of what was once a childish mind. Someone else now occupies the house where we used to live. I look at it gladly, thinking and reminding myself of the good old days. The past is dead and buried, never to return, leaving behind fond memories of people and places from yesteryears. Ubon brings me fond memories of an era that will never return; of people I knew then and my frequent often-pleasant interactions with them; and of places in my childhood. I love Ubon. I miss Ubon. I shall return. By Train — From Hua Lumpong, Bangkok, get off at the railway station is located just outside of Ubon City, across the Mun River in Warin Chamrap district. Variety of times, fares, and classes are available for your journey.By Air — The airport is conveniently located in town, and you can get to and from most anywhere in the city within 15-20 minutes. Flight time takes around one hour. By Bus — Most of the buses run overnight. You can get VIP class express that takes about eight hours or a low fare “local’ that makes many stops and sometimes standing room only on board. It’s fairly easy to get seats from Bangkok and Pattaya.